Today is a very sad day, especially in Uganda. 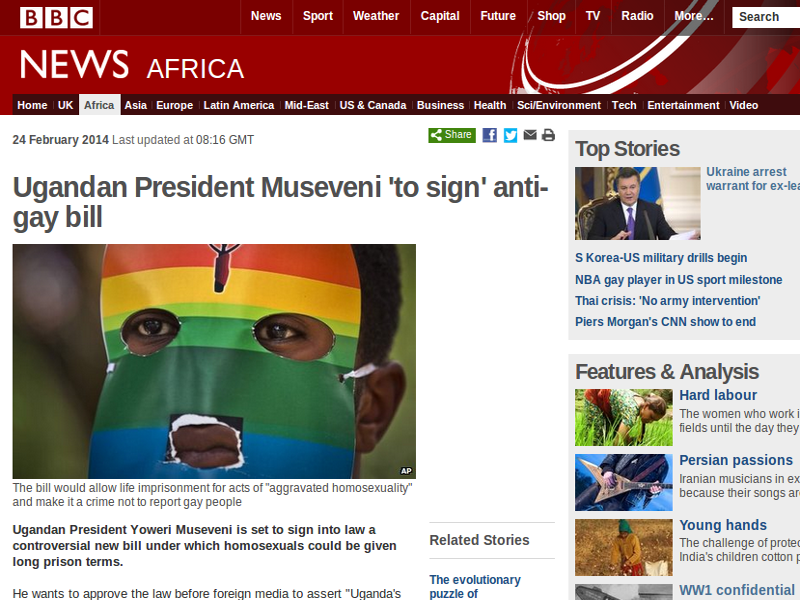 Monday 24th February 2014 is almost certain to the be the day that President Museveni of Uganda signs his country's new law on homosexuality. There is already a Ugandan law prohibiting sexual acts between men, but this is now being extended to cover women as well and the penalties are being greatly increased. Read the BBC's article for fuller details. Originally, the new law would have included the death penalty for some activites, but mercifully (and wisely) this has been dropped. Heavy prison sentences remain (including life) and the law even makes it a legal requirement for all citizens to report people they believe to be gay. Personally, I am strongly opposed to the new law. More than a year ago I signed one of the online petitions calling for the law to be abolished. But public petitions, religious leaders and foreign governments have all been ignored in their pleas and demands that the law be abandoned. Of course the pressure will not stop now, nor should it. On the other hand, there are powerful political, public and religious pressures within Uganda backing the signing of the bill. My personal plea to President Museveni (if he is paying attention to public comment) is to think again. Signing the bill is sure to lead to more difficulties internationally for Uganda. Turn back from the brink. Do not sign the bill. Resist the voices in Uganda demanding the signing of the bill. The strawberry crown is the heart of the plant; all the other parts (such as the leaves and roots) grow from the crown and remain attached to it. In the same way, Jesus is at the heart of the church. In him we grow and through him we are attached to one another. What is at the heart of a strawberry? I don't mean a strawberry fruit; I mean the plant that bears the leaves and the flowers and the fruit. If you examine a strawberry plant carefully you'll notice leaves and roots, flowers and fruit, and the runners with young plants on them. But notice something else. Unlike many plants the strawberry has no stems and no branches. From the deepest root to the tallest leaves and the longest runners, every part is joined together in the centre. Does this sound familiar? It should do! The centre of church life - What is at the centre of the church? Jesus is! The heart of a strawberry plant is called a 'crown'. The leaves, the roots and the rest all spring direct from the crown. The strawberry crown rests at ground level and planting strawberries too high or too low will cause them to grow poorly or even die. Jesus needs to be at 'ground level' in the life of the church, and everything about the church springs from him [Tweet it!]. We all inherit his nature; we all need to stay in touch with him. And being in touch with him implies that all of us will be in touch with one another also because we will all be where he is. The different parts of a strawberry plant stick out in different directions, but they are all joined to the centre. And that's exactly how we are in Christ. And that's why, in the context of church, we must always focus on Jesus and recognise that his proper place is at the centre of everything we are and do. Is Jesus at the centre of all you think, say and do? Having everything joined to the centre keeps a strawberry plant small. Does this affect your view of church? How does a strawberry grow? 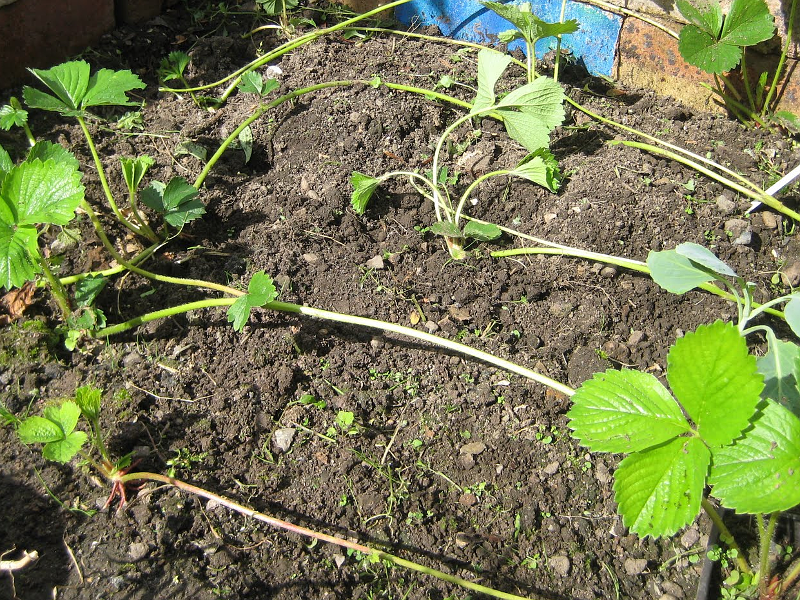 Strawberry plants reproduce vigorously by means of runners. 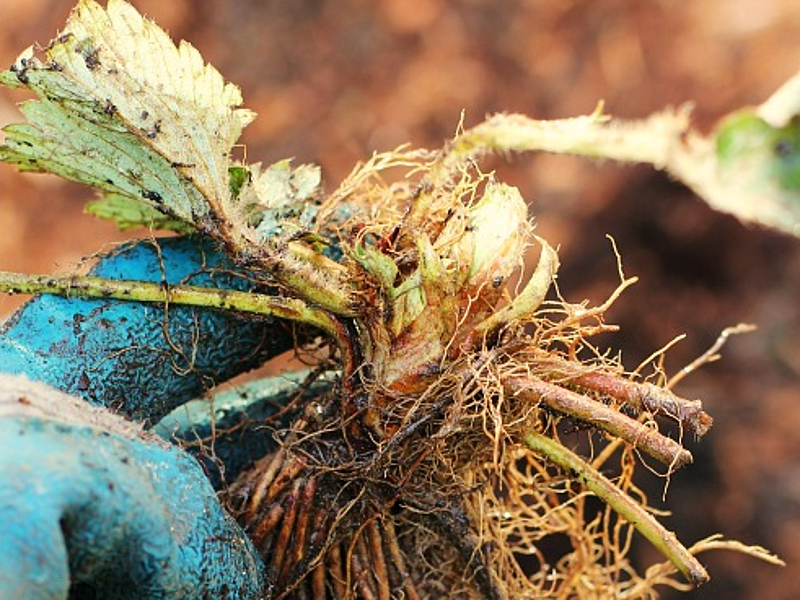 Each year a plant can produce several more which will root themselves in the soil before the connection with the original plant is lost. If strawberry plants didn't die we would soon be inundated. The humble strawberry is a powerful example of the explosive growth of movements [Tweet it!]. A strawberry plant is not very large. It is not tall like a tree, and it's not wide like a bush. You will rarely see a strawberry plant wider than about 30 cm or higher than 20 cm. The plant has a small root system and a central growing point with anything up to about thirty leaves. It is not protected by spines or thorns or poisonous compounds, it carries small flowers with white or pale pink petals, and it produces the beautiful fruit that most of us love to eat with cream in the summertime. And that's more or less it. Here's what happens when a strawberry is planted and left alone to grow. Runners - In late summer, strawberry runners appear as little shoots growing from the centre of the plant. At first they grow upwards, but soon begin to bend under their own weight. At the end of each runner, a small strawberry plant begins to form. Eventually the runners are long enough to touch the ground, looping up and out and down. By this time the little strawberry plants at the end of the runners have started to grow roots. These take hold in the soil and the baby plant grows. Finally the runner shrivels and dies and the new little strawberry is on its own. And strawberry plants are very good at making runners. It's not unusual to find a runner making another runner, even before the first baby plant has taken root. In fact, this can happen several times so that the mother plant has a daughter, a granddaughter and a great granddaughter all at the same time! Not only that, the original mother plant will probably produce three or four runners, or maybe more. Twelve months later, all these young plants will have rooted, become independent and will be producing strawberry fruit (and more runners). Can anyone spot a parallel here with the way the church grows? It might not seem at all obvious, but it's there. Maybe there's little resemblance to church growth in terms of the institutional, denominationl systems that are all around us, but what about the early church as represented in the New Testament? Think about it! How many plants will there be after three years? Why doesn't church grow like a strawberry? Or does it? Can it? Should it? The secret of success is to be unafraid of failure. We may fail repeatedly on the journey to success, but if we are afraid to fail and ashamed to fail we will never experiment and so we will never reap the amazing rewards of success. Paul Saffo is a technology forecaster in Silicon Valley. When the BBC asked him to identify the secret of Silicon Valley's huge success, here is what he said. The secret to Silicon Valley's success? We know how to fail and we have been doing it for decades. Failure is what fuels and renews this place. Failure is the foundation for innovation. Failure is essential because even the cleverest of innovations - and businesses - fail a few times before they ultimately succeed. Consider Google: at least half a dozen other companies tried to turn search into a business, but Google was the first to crack the code and turn search into a huge business. And even when companies succeed, the only way to survive in the long term is to flee into the future by relentlessly innovating. Church life fail? - If church in the West is to survive and flourish, we need to change the way we do things and the way we think. Church as we know it in the West has been retreating gradually for as long as I can remember. The same old ways will not do better tomorrow than they did yesterday. How will failure help us succeed? It won't! So what does Paul Saffo mean by 'knowing how to fail'? What does he know that we don't? It's not failure that brings success, but the willingness to fail. When the key to success is to do things differently it's essential that we experiment. Sometimes experiment fails. Perhaps it fails often. But sometimes it succeeds. Trying new things, experimenting wildly, and not being afraid to fail - this is what has made Silicon Valley so successful. To succeed it's essential to have a dream and to run with it. And if it fails, try again with something else. Church in the West needs to experiment madly without fearing failure. It's like surfing. Keep trying to catch the big wave. Sometimes you will miss and be left behind and will have to try again on the next wave. Sometimes you will catch it just right and be propelled forward at high speed. It will be exhilarating. The successes redeem the failures. So if you are involved in church life and there seems to be little or no progress, go and try a load of new ideas [Tweet it!]. When something works, run with it. You will be propelled forward at high speed and it will be exhilarating. Go for it! Which of the following strategies is most likely to succeed? Doing again what failed last time, or trying something new and untested. You have never tried surfing. Do you expect to succeed or fail on your first attempt? 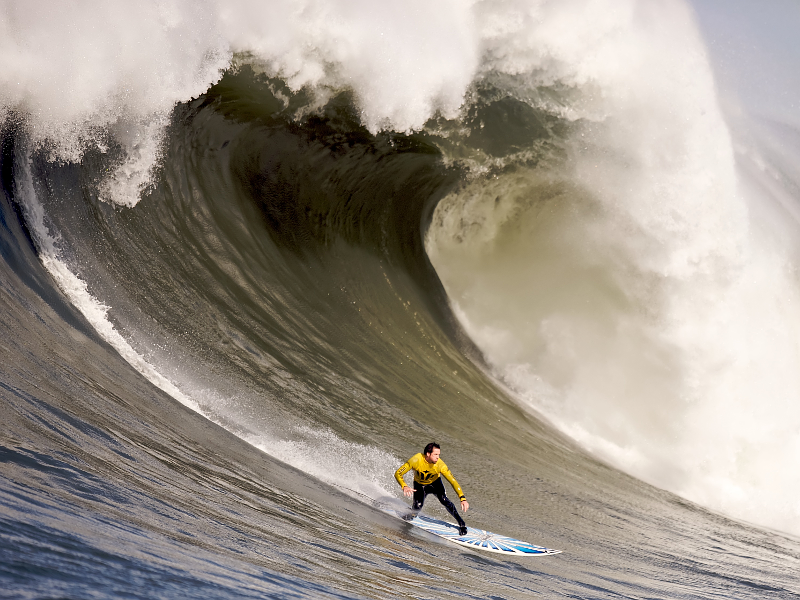 Where will you go for advice, an experienced and successful surfer like the one in the photo or a novice like yourself? Success is a common goal and driver in Western culture. Does this make it easier or harder to try out new ideas? 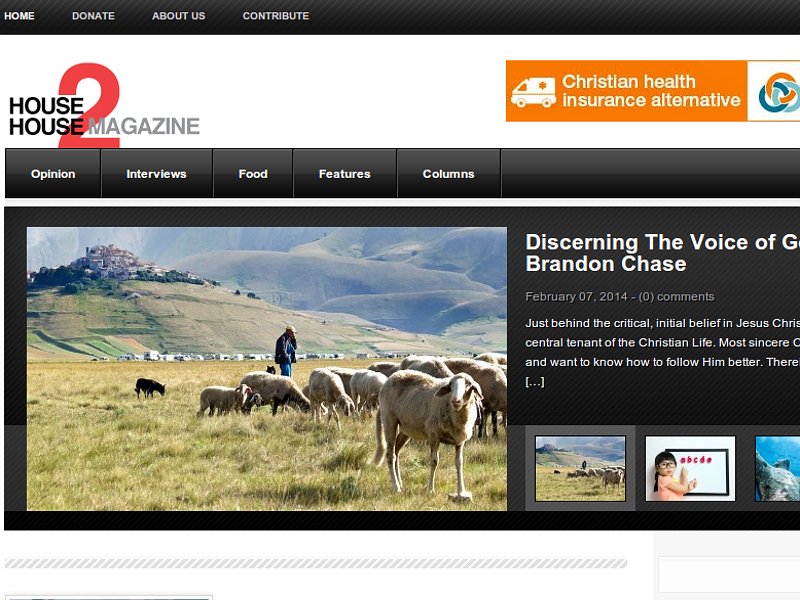 House2House magazine has interesting articles for people who follow Jesus. There's a lot of good material here, so visit the site, take a look, and decide for yourself. If you like what you see you can sign up for delivery by email. Prepare to be encouraged and challenged! House2House Magazine is a great resource for anyone committed to life in Christ and especially (but not exclusively) for those interested in smaller forms of church gathering. Meetings at home, in places like pubs and coffee shops, organic expressions of church, missional movements, small groups and cell groups - all of these and more will find much of interest and value in the online magazine. House2House publishes frequent new articles on a range of church topics [Tweet it!] including hearing the voice of the Holy Spirit, growing in the journey with Jesus, encouraging one another, giving, stories from the lives of real people, spiritual gifts, reaching local people and much, much more. History - Let me tell you a bit about the origins and history of the magazine. Some years ago, Tony and Felicity Dale launched a printed magazine of the same name. It ran for a while and was distributed world-wide in a variety of ways. Paper publishing is in decline due to the convenience and efficiency of the internet and the web in particular. House2House eventually decided to cease publication, and a recent effort to relaunch it as a crowd-funded venture failed. Now, however, it's available once more as an online magazine. It's free for anyone to read, is funded through donation by those who are led to do so, and is regularly updated. Don't miss out on this great resource. Read the articles, sign up to receive new material by email, and discover what others are thinking and doing. And if you feel brave, enjoy writing and have something to say, create an article of your own and submit it to the editors. Have you come across House2House Magazine before? Do you find stories about church life interesting? Are they helpful? Do they encourage you? Would you consider writing an article and submitting it?